Would you like to buy products only available in Rothenburg ob der Tauber? Would you like to have a look behind the scenes of the production process? That’s not a problem with the Handmade in Rothenburg Initiative. And anyway, Rothenburg ob der Tauber is paradise for Christmas fanatics! Rothenburg’s side streets are wonderful for strolling. 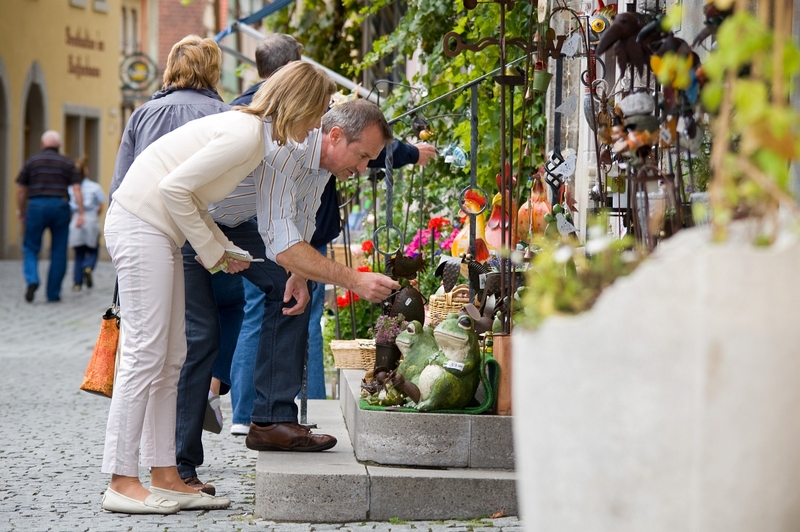 And in the old city over the Tauber is a whole host of gifts and souvenirs to discover. 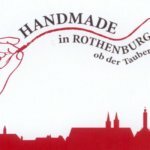 And those looking for something exclusive to Rothenburg ob der Tauber don’t only have the Handmade in Rothenburg initiative to choose from. Traditional Rothenburg markets such as the spring market at the end of April and the Reiterlesmarkt at Christmas offer a huge range of locally crafted wares. Wooden toys, colorful kilned ceramics, drawings of historical buildings and quality workmanship jewelry. Stadtmarketing Rothenburg e.V. 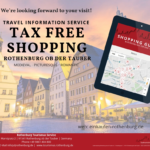 provides this overview of shopping possibilities all over Rothenburg ob der Tauber – with special information about tax free shopping! Local Rothenburg ob der Tauber manufacturers have joined forces under the slogan: “We show you how we manufacture.” Whether it’s at the AnRa fashion store, the allegra chocolate store, Leyk’s Lichthäuser store or at the Schottenladen Scottish store, visitors can look behind the scenes at each of them. The range of gift ideas is enormous. Clothing designed and made from natural materials in Rothenburg sets the fashion from AnRa apart. The Schottenladen Scottish store offers quality handmade pipes. Each one unique. The lighthouses from Leyk are hand crafted and painted and visitors can watch the staff skillfully at work in the lotus garden production shop. Alex Hildebrandt at allegra Schokolade learned his craft as a chocolatier in Switzerland – not a bad sign. His courses for the whole family are incredibly popular at Christmas and Easter. Showcase wood art can be admired in Schmiedgasse. All participating stores are listed in a brochure available from the Rothenburg Tourism Office. Herrngasse in Rothenburg ob der Tauber is like a magnet drawing Christmas enthusiasts in from all over the world. The reason why: It’s the location of the Käthe Wohlfahrt Christmas village. The red gift car on the street points the way and happily stands bathed in camera flashes for souvenir photos. Even in summer, at temperatures of 100° F, once you pass through the entrance, you’ll feel like you’re in a winter wonderland. Glass globes, nutcrackers, candle arches and wooden pyramids are all available to buy at the Käthe Wohlfahrt Christmas village. Sometimes, a lathe operator will even demonstrate his work live in the store. Anyone who stays at the Glocke winery and hotel and can’t get enough of the delicious Thüraf family’s Franconian wines, doesn’t have far to go. The store is next door to the hotel and sells wines from the family’s vineyards. 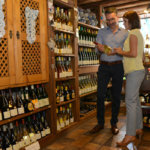 In addition to classic grape varieties such as Bacchus, Johanniter, Silvaner and Riesling, visitors can also purchase rarer wines such as Tauberschwarz, Muskat-Trollinger and Süßschwarz. And this is the only place you can do so. 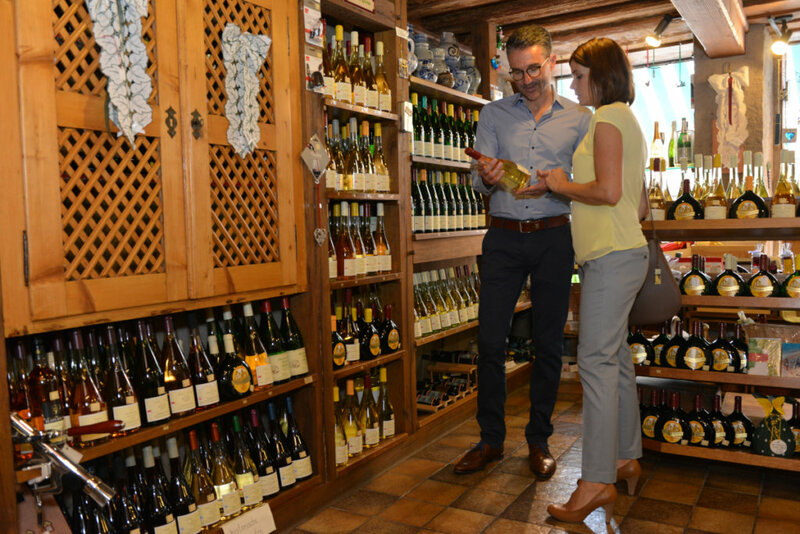 Behind the store are the family’s wine cellars in which groups can enjoy atmospheric wine tastings. What would Franconia be without its sausages – everyone from the region is proud of THEIR Bratwurst. Butchers offers a wide range of homemade sausage produce. There are even local butchers along the streets of the old city selling products from the region. Smoked Bratwurst is particularly suited for taking home with you!